Eric Boswell Wynalda (born June 9, 1969 in Fullerton, California) is a retired American soccer player and sports broadcaster. He was the co-host of Fox Football Fone-In on Fox Soccer Channel and is currently employeed as the president of international operations at Mexican third division club Murcielagos. Wynalda scored the first goal ever in Major League Soccer in 1996 and was the all-time leading goalscorer for the United States national team until 2008. He was elected to the National Soccer Hall of Fame in 2004. Wynalda, of Dutch ancestry, grew up in Westlake Village, California. As a child his team (the Westlake Wolves, with Eric's father Dave as the head coach) won the state championship in AYSO soccer as Wynalda scored more goals than the entire division his team played in, combined (56 goals in 16 games). He later attended Westlake High School and was a three time All State selection with the school's boys soccer team and a youth club team mate of fellow national team player Cobi Jones. He attended San Diego State University from 1987 to 1989 where he played for the Aztecs men's soccer team, scoring 34 goals and assisting on 25 others during his three seasons. His freshman year, SDSU went to the NCAA Men's Soccer Championship game where it lost to the Bruce Murray led Clemson Tigers. While at SDSU, he also played two seasons with the local semi-pro San Diego Nomads of the Western Soccer Alliance. In 1988, he played a single game and in 1989, he played 5 games with the Nomads. Leading up to the 1990 FIFA World Cup, Wynalda signed a contract with the U.S. Soccer Federation (USSF). After the World Cup, Wynalda signed as an on loan player from USSF with the San Francisco Bay Blackhawks of the American Professional Soccer League. During his nearly three seasons with the Blackhawks, he played only a handful of games with the team, devoting most of his time to the national team. In August 1992, USSF loaned Wynalda to Bundesliga club Saarbrücken for $45,000. When he arrived at Saarbrücken, he became the first American-born player to play for a top level German club. He had an immediate impact on the club, scoring eight goals in the first half of the season. This led Saarbrücken to purchase Wynalda's contract from USSF for $405,000. Wynalda was awarded the Bundesliga Best New Comer of the Year Award, making him the first American-born player to receive an honor of that magnitude overseas. Wynalda scored 14 goals and had 25 assists in the 1993-1994 season and was named the league MVP; again making him the first American-born player to receive that type of honor in a European league. He was transferred to fellow Second Division club VfL Bochum at the end of the season for $850,000. He had a hernia operation on August 30 which put him out of action. Wynalda came back to the States in 1996, signing with Major League Soccer (MLS). As part of the process of creating the new league, known players were distributed throughout the league's new teams (except for the Dallas Burn, which alone amongst all MLS sides never received a US National Team allocation from the 1994 World Cup era). The league allocated Wynalda to the San Jose Clash. On April 6, 1996 Wynalda scored the first goal in league history in its inaugural game as the Clash beat D.C. United 1-0. He was named U.S. Soccer Athlete of the Year. Wynalda was loaned out to Club León in Mexico in 1999. He tore both the ACL and medial meniscus on his left knee while with Leon which put him out of action for several months. After missing the first eleven games of the 1999 season, the Clash traded Wynalda to the Miami Fusion. On July 8, 2000, the Fusion turned around and traded Wynalda to the New England Revolution for Ivan McKinley after Wynalda failed to improve the Fusion's offensive output. On May 3, 2001, the Revs sent him to the Chicago Fire for John Wolyniec, where he finished his MLS career, ending up with a total of 34 MLS goals (plus two in the playoffs). In 2002, Wynalda attempted to join the Los Angeles Galaxy, announcing that he planned to retire with the team. However, the negotiations with the Galaxy did not work out and he signed for the Charleston Battery of the USL First Division. Wynalda joined the team only to tear his anterier cruciate ligament in a pre-season match. He elected to retire from professional soccer and became a broadcast announcer. Wynalda earned his first cap against Costa Rica on February 2, 1990. On March 14, 1990, he signed a contract with the United States Soccer Federation which made him a full-time national team player. 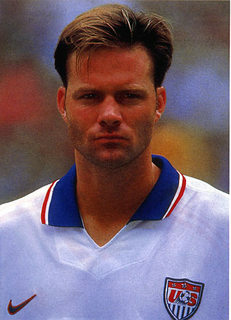 Later that year, Wynalda played in Italy 1990; his first World Cup. In the 1994 FIFA World Cup, Wynalda scored on a free kick from 28 yards as the United States tied Switzerland. He also played in Copa America 1995, where he was named to the all-tournament team after scoring against Chile and Argentina. In 1998, Wynalda participated in his third World Cup, one of only three U.S. players (the others being Tab Ramos and Marcelo Balboa) to have earned that honor at that time. He finished the 1998 World Cup with 20 goals. Wynalda retired from the US National Team as its all-time leading scorer with 34 goals in 106 appearances. He was the soleowner of the record until 2007, when Landon Donovan tied the record with a penalty kick goal against Mexico in the 2007 CONCACAF Gold Cup final. Wynalda lost the record when Donovan scored yet another penalty kick in a friendly match against Sweden on January 19, 2008. Wynalda was named the Honda US Player of the Decade for the 1990s, was named to the CONCACAF All-Decade Team of the 1990s and was elected to the National Soccer Hall of Fame in 2004. In 2006 he was named to the Ventura County Sports Hall of Fame.